Susan Simmons can tell that her new substitute teacher is really weird. But she doesn't know how weird until she catches him peeling off his face - and she realizes that "Mr. Smith" is really an alien! At first no one will believe her - except Peter Thompson, the class brain. When Peter and Susan discover Mr. Smith's horrible plans for their classmates, they know they have to act fast. Only they can get rid of their extraterrestrial visitor - and save the rest of the sixth grade class from a fate worse than math tests! Bruce Coville was one of my favorite authors growing up, and I devoured just about everything he wrote. 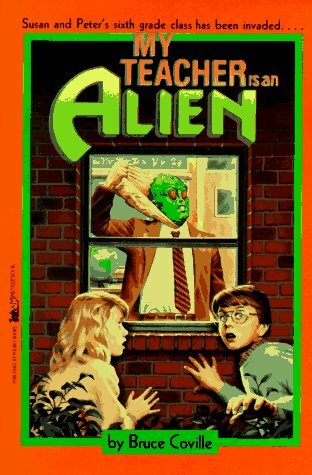 The two alien series - My Teacher and I Was a Sixth Grade Alien - were my favorite of his books. So imagine my excitement when I found near-pristine copies of a bunch of those books at the local Friends of the Library bookshop! My Teacher is an Alien starts out with Susan and her sixth grade class coming back from spring break to discover that their favorite teacher, Ms. Schwartz, is gone and Mr. Smith will be their substitute teacher through the rest of the school year. Nobody likes Mr. Smith, and he clearly doesn't like them or the way their former teacher ran their classroom. One day, Susan is writing a rather unfriendly note to her friend when she accidentally allows it to be collected with her test. She decides to follow Mr. Smith home to see if she can somehow sneak it out of his briefcase. She's about to grab the note when she hears an awful noise coming from inside the house and decides to go in to make sure Mr. Smith is all right. As it turns out, he's find, but Susan isn't. She saw Mr. Smith peel off his human face - he's an alien! Even worse, he's planning on kidnapping five kids from her class to take back and study! Susan only has a few days to get everyone to believe her and stop the alien abduction from happening. Kids' books are always interesting to go back and read with an adult perspective. Coville fills the first chapter or two with his ideas about education, and Susan's father also seems to be Coville's voice throughout the story. This is a really cute book about kids showing independence and demonstrating to adults that sometimes they really do know what's going on. After all, isn't that what all kids want adults to realize? Also, the book is classified as science fiction because of the alien aspect, but really it's more of a mystery. If you or your kids have never read Bruce Coville's books, I highly recommend them! I love the My Teacher is an Alien series!!!! They were some of my favorites growing up. He wrote a great series about ghosts--I don't know the name of the series, but the books at The Ghost Wore Gray, The Ghost in the Third Row,and The Ghost in the Big Brass Bed. If you haven't read them, you should. They are awesome.